I've had some of my readers ask me if I "meal plan" to save money. The answer is: no. However, I do have a fully stocked pantry full of easy staples that can be combined in many different meals in a pinch. I shop at 3 different grocery stores (Kroger, Food Lion and Walmart) and buy the loss leaders that are free or close to free using coupons. I often order bulk coupons from Ebay when I know something will be on sale for a while. Cook potatoes, onion, pepper and salt in the water until potatoes are tender (for me this was about 30 minutes). Mix the milk and flour together and wisk together. Throw that in the pot with the margarine and simmer for 15-20 minutes. 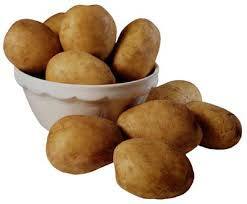 Crush a few of the potatoes on the side of the bowl to add thickness. I had some celery the kids hadn't eaten and cut that up too and I also had some leftover ham in the freezer--so that went in too! The result was a rich and hearty soup that, coupled with some homemade bread was a great and super thrifty meal! And there was leftovers to eat the next day or freeze. 5 lbs of potatoes are on sale this week at the Lexington, Va. Walmart for $1.88! If you have a fun and thrifty recipe that you would like to share with me, please do! I'll credit you with your recipe and let the readers know how my family of Picky Pete's liked it. I made this the other day. I also added celery, and some carrots that I HAD to use. It was filling and a perfect meal for a cold day! Thanks, Manda!